Avro Keyboard and Bangla Spell Checker! The last Bangla software package you'll ever need! Avro Keyboard was born in the 26th March, 2003 (The Independence Day of Bangladesh), bringing a new era in Bangla computing. It's flexible, gorgeous, feature rich, totally customizable, user friendly and already has a lot of typing automation tools that you have never imagined! Avro Keyboard, simply the Best Bangla Typing Software, breaks all old records, wipes out obstacles, rewrites history and recreates tradition! We have researched through all present English to Bangla transliterating softwares and made our easiest transliteration scheme, both for memorizing and friendly typing speed. See on the fly how your English text is converting to Bangla! This English to Bangla phonetic typing method supports Dictionary with near about 150000 Bangla words and auto-correct feature. We have left the auto correct dictionary totally editable by the users. Add your own words, modify them anytime, and correct most common mistakes on the fly automatically! Avro Keyboard supports traditional keyboard layout based Bangla typing. Get the most popular Bangla keyboard layouts in Bangladesh and India at hand! Unleash your typing speed with this great algorithm. In a good number of cases, simply typing the kar/matra/short form of vowel will produce the full form of vowel automatically, there is no need to type the Link key. For detail information, please read the Documentations. This Automatic Vowel Forming can also be kept disabled from the Configuration dialog box. Although in phonetic typing method Reph is typed at the beginning of a consonant, this may be seemed peculiar to the users (and it happened!). Avro Keyboard now uses the “auto Reph” feature, which will automatically move the Reph at the beginning of a consonant/"juktakkhor" (conjunct) when you type it at the end. This Old Style Reph can also be kept disabled from the Configuration dialog box. You can also type Assamese using all these keyboard layouts as necessary Assamese characters are placed here. Easiest method made ever for typing Bangla! Use the full-featured on screen Bangla keyboard for your typing. Nothing to memorize, just click and type Bangla anywhere! You can also type Assamese using mouse as necessary Assamese characters are placed on the on-screen Bangla Keyboard. Avro Keyboard comes with a handy Bangla spell checker. You can check spelling right inside MS Word. For spell checking on plain text, there is also Avro Pad. Both Unicode and ANSI typing support! From the very first release, Avro Keyboard is fully Unicode complaint. From version 5.x, it also supports ANSI fonts (fonts compatible with Bijoy 2000). With Unicode fonts, Avro Keyboard also comes with Siyam Rupali ANSI and Kalpurush ANSI fonts. Now Bangla typing works everywhere, from Photoshop, Illustrator, MS Word to Notepad. Users have different choices and needs. Avro Keyboard is built for all of them. Ins and outs every feature of Avro Keyboard can be customized! Avro Keyboard works as a system level keyboard interface. You can type Bangla anywhere with all typing methods (English to Bangla phonetic typing, keyboard layout based typing, mouse based typing) supported by Avro Keyboard. 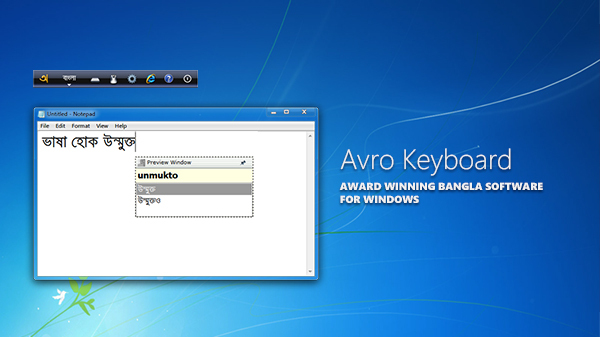 Avro Keyboard offers much flexible user interface for even novice computer users. It is much better than Windows Input Locale as there is no necessary to edit your system language from control panel. Users can use Avro Keyboard and any other keyboard in any language defined in control panel simultaneously. It is possible to use Hindi, US English, UK English, Japanese, French etc. any language as system language and Avro Keyboard to use Bangla/Bengali. When Avro Keyboard is "System Default" mode, users are able to use their system language, when in "Bangla Keyboard" mode, no matter which language is active in the system, only Bangla typing is possible. Most Bangla typing softwares offer only system tray based keyboard interface for users. Here Avro Keyboard has two different and full functional interfaces - Top Bar on Desktop, Icon on system tray. Users are at liberty to use any mode which suits his best. Even more, the Top Bar is able to appear as semi-transparent when inactive so that you can see behind it! You can use "Single Key Mode Switching" by using any one key from F1 to F12 to switch between Bangla keyboard mode and System Keyboard mode.There is also Ctrl+Spcae key combination option. Use what you like. Just like Windows keyboard management, Avro Keyboard is able to track the keyboard modes (System Default / Bangla) among all applications. And from version 3.0.0, Avro Keyboard not only tracks keyboard modes, but also all Languages you are using. Type Hebrew in Notepad, Arabic in WordPad, or French & Spanish in MS Word, whenever you type Bangla in them, your previous Language is automatically recorded. When you go again in System Default keyboard mode, Avro Keyboard never mess things up, it will correctly restore all languages (e.g. Hebrew in Notepad or Arabic in WordPad etc.). This is a must have feature for any virtual keyboard interface like Avro keyboard. But all including Microsoft seem to overlook it. With this handy tool, users can see the actual image of the current keyboard layout anytime they need. Now there is no need to print or draw a keyboard layout and attach it on your computer table. This keyboard layout viewer is totally flexible, you can use Zoom-in and Zoom-out for better viewing purpose. Even more, this Layout Viewer can be configured to come up automatically in Bangla mode and disappear again in System Keyboard mode, nice choice when you are learning a new keyboard layout! Latest version is 5.5.0. See version history. Open type fonts (OTF) allow you to type Bangla and English in the same font. You only have to change the keyboard mode. UNICODE standard Bangla typing allows you to search/sort Bangla texts in accurate way without any hassle. Extremely useful when you are working in spreadsheet or database application. Like older methods of Bangla typing, you don't have to change the fonts every time you change keyboard between Bangla and English. Again, for using some matra/kar/short form of Bangla vowels like "o-kar", "ou-kar", you can use only one key to type them. These features have made Avro Keyboard as a perfect choice for professional typists for Bangla typing. Bangla typing gets its most modern form in Avro keyboard. Instead of using symbolic typing like old mechanical type writers, you can use easy phonetic typing method. Bangla typing is no longer a nightmare!! Outlook Express and other email clients those support UNICODE, let you mail in Bangla using Avro keyboard. Some instant messengers like MSN Messenger allow you to chat in Bangla. With Avro keyboard, you can even type Bangla and English in a single sentence in MSN Messenger. There is even no need to use any extra plug-in! Avro Keyboard is compatible with any UNICODE supported Bangla font. Even if you cannot afford to buy some commercial/shareware UNICODE compliant Bangla typing software, you can install the fonts of that software and use them with Avro Keyboard for Bangla typing. As Avro Keyboard supports Input Language/Input Locale changing for Bangla (India), Bangla (Bangladesh) and Assamese, the editors (Like MS Word) you use to type Bangla can detect which is Bangla text and which is not. Now MS Word never try to check spell of your Bangla text using the default English dictionary! You can safely turn on the auto correction feature in MS Word when typing Bangla with Avro keyboard. Your texts will never be changed to any alien characters. Now MS Word knows that you are typing Bangla! Copyrights © OmicronLab. Licensed under Creative Commons.